At the end of the Oklahoma Sooners’ 31-16 victory over Ohio State in Columbus, Baker Mayfield taunted the crowd in one of the coolest possible ways: He planted an Oklahoma flag at midfield. 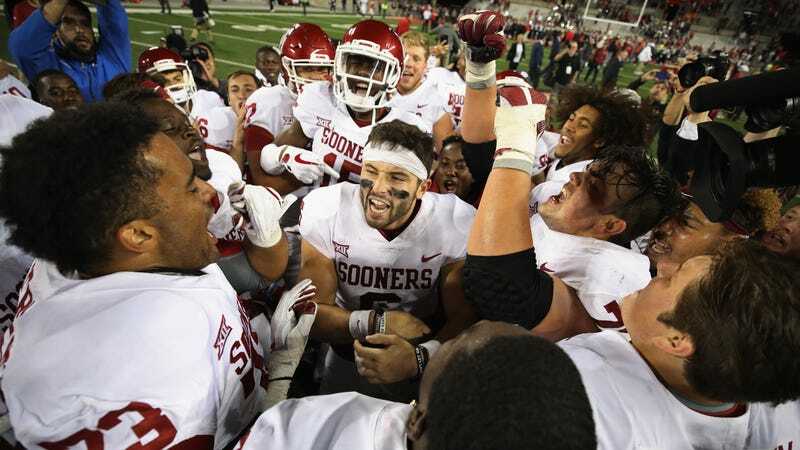 Mayfield said after the game that his move, while unplanned, was motivated by some lingering feelings from Ohio State’s 45-24 pounding of Oklahoma in Norman last year. That’s cool! College football is at its best when the two teams playing have a little bit of resentment for each other. After throwing three TDs and netting 386 yards on 27-of-35 passing, Mayfield had earned the right to taunt. But apparently, the flag planting was disrespectful, because Mayfield apologized today for his actions. “It was an emotional game, so after the game I did not mean for it to be disrespectful to any Ohio State people at all,” a subdued Mayfield said. Mayfield’s apology is weird and surprising, because unless you go deep into the Ohio State corners of the internet, it’s hard to find people who are legitimately outraged at him. Was he scared of former Buckeye and current Detroit Lions lineman Taylor Decker, who tweeted that Mayfield “can drink bleach?” (Probably not.) It feels like someone at Oklahoma told Mayfield to tone it down, and in doing so sucked the fun out of a very promising feud.